Banixx is delighted to announce an alliance with Dr. Richard Porter where he will give free veterinary consultation over the telephone. Banixx Pet owners will now be able to contact Dr. Porter via email or telephone and obtain veterinary advice and consultation at no cost. Dr. Richard Porter attended Veterinary College at Iowa State University with a Doctorate of Veterinary Medicine. He went into practice with the main focus on large animals. As time grew, he became interested in health and wellness as his small animal practice evolved. He recognized as a large animal practitioner that the farmers wanted him to keep the animals well with diet and supplements. He pondered why, in small animal medicine, they were taught to just treat the symptoms. Diet and wellness were sometimes added as just a side note. Dr. Porter also was a veterinary consultant for KV supply, where he spent a great deal of time listening to others and researching about health and wellness concerning animals and humans. Across the nation, Dr. Porter has used his knowledge and wisdom not only to save countless pets lives but also to advise their owners what is needed for them to live a long healthy life. PINEHURST, NC – January 2017 – Banixx®, the #1 trusted First Aid solution for horse & pet owners, now offers a veterinarian strength shampoo that is ultra-enriched with Marine Collagen protein. The new Banixx® Medicated Shampoo, developed at the repeated request of customers, was formulated to aid horses in the recovery of multiple anti-fungal/anti-bacterial skin conditions such as Rain Rot (Rain Scald), Scratches, Girth, Mane, & Tail Itch, and Dermatitis. It provides sea-sourced amino acids that fortify hair fibers and repair damage. 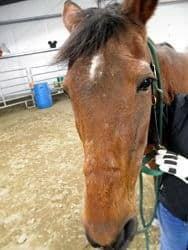 Finally, a shampoo that is effective against common equine skin infections, as it provides deep-skin gentle cleansing, works to rebuild, moisturize and strengthen a horse’s coat, and will leave your horse shining from mane to tail. Banixx® Shampoo with Collagen is unique with its soap-free formula free of parabens, sulfates, and contains no alcohol or steroids. In addition, this deeply moisturizing and soothing shampoo is non-toxic, contains no added color or fragrance, and can be used daily for spot treatments or as an all-over body cleanser. Banixx® Shampoo is safe for all horses and will not bleach, stain, or affect coat color. For nearly a decade horse and pet owners have come to trust the name Banixx® and, the new shampoo is the perfect addition to their ‘stable’ of top-quality products. Supporting the work of animal rescue organizations will always be a priority for Banixx. However, we also believe that an integral part of solving the problem of animal homelessness and overpopulation is developing affordable spay/neuter options and better education for pet owners about the importance of spaying and neutering. Banixx is working with animal rescue facilities to award monthly spay/neuter certificates for those who cannot afford the surgery. Working through its long-term relationship with Danny & Ron’s Rescue, of Camden, S.C. we are learning how best to fund these initiatives. Banixx collaborated with Military Working Dog Team Support Association in order to provide seven cases of Banixx Pet Care to our Military Working Dogs in Afghanistan and several cases for Dog Handlers at the Fort Hood Army Base. One amazing aspect of the Banixx product is that its efficacy is in no way affected by exposure to heat, sun or freezing; which is also important when shipping to geographic areas where temperature extremes are the norm. Banixx also has zero odor and zero sting, so it will not raise alarm or cause anxiety for these hard-working members of our military. You’ve heard of it, perhaps you even keep a bag on hand. Or maybe it’s already a regular part of your horse’s diet. But whatever the case may be, beet pulp, a lowly sugar industry byproduct turned equine feed, is a dietary option worth considering for your horse’s health and wellbeing. 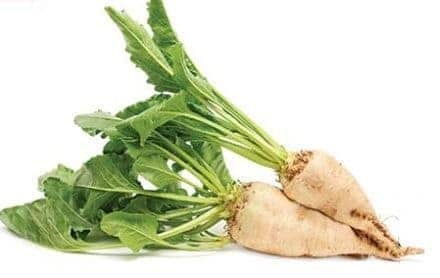 Popular around the country and the world, beet pulp is high in digestible fiber and is a good source of “safe” structural carbohydrate‐calories. However, there are also many myths and misunderstandings about beet pulp. As a result, this very versatile feed is often avoided, relied upon too heavily, or used incorrectly in many horses’ diets. 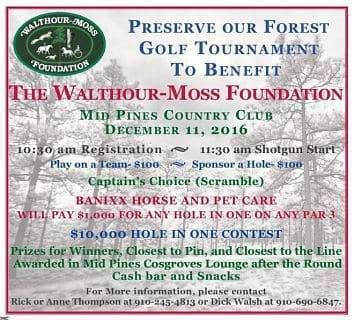 Banixx is offering $1,000 for each Hole-In-One at this Event that benefits the Walthour-Moss Foundation. The WMF is a private foundation set up to protect and preserve over 4,000 acres of incredible forest and open land in North Carolina as a sanctuary for wildlife and for the enjoyment of mankind (as long as he is on foot or on a horse – motorized vehicles of any sort are strictly prohibited). Its importance to the health of our world cannot be overstated. 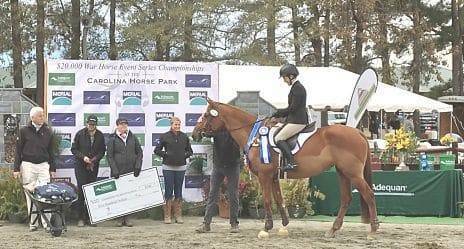 Banixx was proud to be part of the $20,000 War Horse Event Series (WHES) presented by Southern Pines Equine Associates, Adequan, and Merial, which concluded its spectacular 2016 season with the November WHES Championship & Horse Trials. In 2016, Warriors Claim benefited from this Event. This series recognizes the hard work of competitors at every level from Green as Grass to Training! Banixx contributed over $1,500 in prizes. Prizes were awarded to Individuals through 6 places, Team, Second Chance Rescues, TIP, and 4H Leaderboards. 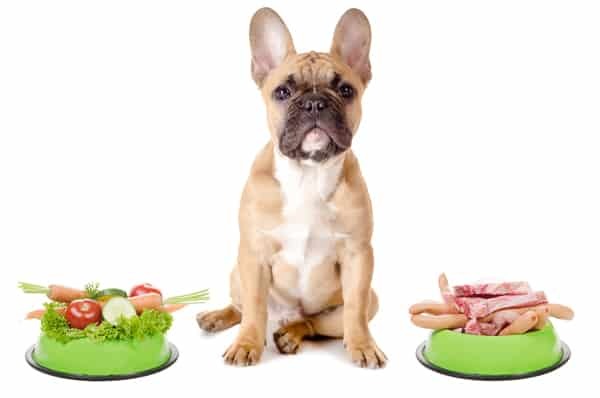 Nowadays many of us are eating better and getting more exercise to lead a healthier lifestyle and the same should be true for our four-legged friends. The growing obesity trend in America is also starting to affect the canine population and they face the same health risks as their human counterparts when it comes to being overweight. #1 – Watermelon: You may have seen an adorable video recently of a cute, little French Bulldog who gobbles up watermelon while sitting inside of the enormous fruit. At over 90% water, this melon contains more lycopene per ounce than a tomato, and this powerful antioxidant can help to reduce heart problems and stroke instances. You asked, and we listened! Banixx! New look! – Same Great Solution! Goats & Reptiles and on and on!….Look for it next time you shop! Here is Jazz, rescued from a sad life of servitude in New York state [left]… now, in a wonderful foster home while she recovers with the help of groceries and Banixx. This was certainly a case of rain rot, but as per usual, Banixx was 100% effective for rain rot treatment. 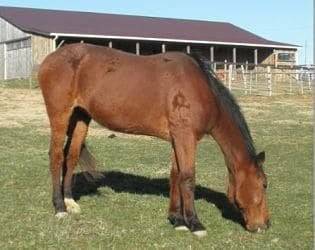 Here is Jazz, today [right], who was rescued by Country Acres and nursed back to health by Karen W.
Jazz has just had her 27th birthday, thus recovery took a little longer than it would have taken had she been a younger horse. 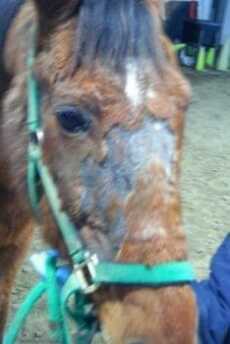 But, clearly, with Kathy’s dedicated care, Jazz was able to rise to the occasion!